The marbles from the Late Archaic temple of Aphaia, comprising the sculptural groups of the east and west pediments of the temple, are on display in the Glyptothek of Munich, where they were restored by the Danish neoclassic sculptor Bertel Thorvaldsen. These works exerted a formative influence on the local character of Neoclassicism in Munich, as exhibited in the architecture of Leo von Klenze. Each pediment centered on the figure of Athena, with groups of combatants, fallen warriors, and arms filling the decreasing angles of the pediments. The theme shared by the pediments was the greatness of Aigina as shown by the exploits of its local heroes in the two Trojan wars, one led by Heracles against Laomedon and a second led by Agamemnon against Priam. According to the standard myths, Zeus raped the nymph Aigina, who bore the first king of the island, Aiakos. This king had the sons Telamon (father of the Homeric hero Ajax) and Peleus (father of the Homeric hero Achilles). The sculptures preserve extensive traces of a complex paint scheme, and are crucial for the study of painting on ancient sculpture. The marbles are finished even on the back surfaces of the figures, despite the fact that these faced the pediment and were thus not visible. ↑ The name Afea appears on all the local signs, Afea being the name of a Cretan woman of unsurpassed beauty. After escaping an unwelcome marriage on Crete, she was rescued by a fisherman from Aegina. In payment for this he also proposed an unwelcome marriage. So Afea headed out of Aghia Marina towards the mountain top where she vanished at the current site of the temple, where it is said that the fisherman established a shrine believing Afea to have been taken by the gods. ↑ The main port and the main city are named Aigina, after the island. 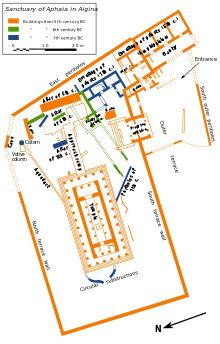 The Temple of Aphaia is 9.6 km east of this city. The sanctuary is also 29.5 km southwest of the Acropolis of Athens, which is visible across the gulf on a clear day. 1 2 Pilafidis-Williams argues that the character and relative proportions of the finds leads to the conclusion that the deity worshiped was a female fertility/agricultural goddess. ↑ The important Bronze Age archaeological site of Kolona is northwest of Aigina (the main city) along the coast, and a museum is located at this site. 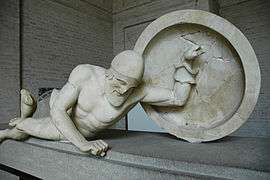 The museum at Aigina was the first institution of its kind in Greece, but most of the collection (other than a collection of bas relief panels from Delos) was transferred to Athens in 1834 (EB), where it can be seen in the National Archaeological Museum of Athens. The museum on the site contains a restoration of the Early Archaic temple entablature and pediment, as well as copies of elements of the pedimental sculpture of the Late Archaic temple set into restored sections of the pediment. 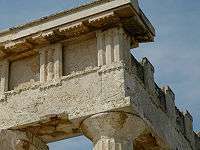 ↑ "East and West Pediments, Temple of Aphaia, Aegina". smARThistory at Khan Academy. Retrieved December 17, 2012. ↑ Ohly disputes that there is sufficient evidence for this oikos structure. 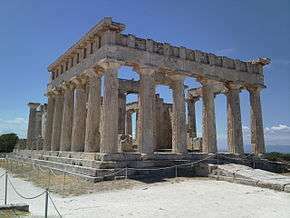 ↑ Hollinshead disputes that there is sufficient evidence for the presence of an adyton in this temple, and she questions whether similarity of form among temples of Artemis must indicate similarity of cult practice. This feature was not retained in the late Archaic temple, so its centrality to the cult practice is open to question. ↑ Schwandner wants this placement to refute the idea that triglyphs are meant to represent the ends of wooden beams. ↑ The use of the 6 by 12 plan of the Late Archaic period soon gave way to the Classical period preference for the proportions of the 6 by 13 plan and similar. ↑ Bankel notes that c. 80% of the triglyph blocks were damaged in a manner consistent with intentional breakage to remove the metopes. ↑ N. Eschbach, Die archaische Form in nacharchaischer Zeit: Untersuchungen zu Phänomenen der archaistischen Plastik des 5. und 4. Jhs. v. Chr.” Unpublished Habilitationschrift, University of Giessen. ↑ Leaflet "The Sanctuary of Aphaia on Aegina", Greek Ministry of Culture, Archaeological Receipts Fund, Athens 1998.